This is the fifth piece of the rare collection of Song Dynasty fluted cups. 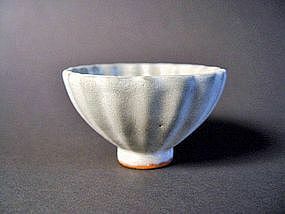 Grey stoneware body covered with a opaque white glaze with fine crackle to above the foot-rim. Where exposed in the firing the body has turned reddish. D : 9 cm. H : 5,5 cm. Southern Song period, 1127 - 1279 Xiuneisi white glazed. Please compare this piece with the Xiuneisi white glazed piece at GG - Art ( Southern Song page ) Condition : The body is perfect ( no chip, no crack ) This excavated piece was buried upside down for hundreds of years and so the condition of the glaze on the inner side of the bowl is quite good, because it was protected trough the bowl itself. The glaze on the outer side of the bowl is eroded.